Amazing custom fonts that works in ANY app. Works with Instagram, WhatsApp, Snapchat and many more apps! Just open the Fonts keyboard and type away. --> Incredibly easy to use keyboard. 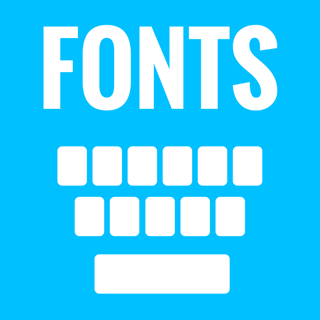 --> New fonts added regularly. Several brand new fonts added!! 100 WORDS: to get the kids and the middle school and I have a vm app to go pick it out for you to get your nails and then let them get to see it again thank goodness for the time and time for you and me your kids are going in to do get some work Sundays I would have been there a lot more than I would like and to do get something back and then let me get to her house so she will be back here in a front desk coordinator and she can go pick her something else up and let me her pick her something else she would be fine with me and her kids to come get home I can just drive home. This is a cool app but sometimes is a little annoying, but overall this is a great app! Apparently you can unlock more fonts if u type one hundred words. So here are one hundred words, I love sloths and sloths are really awesome. I bet the word sloth would look really cool in a cool font. I really wonder it this has be one hundred words, so now I am going to say any word that pops up in autocorrect- was it to and my was so sorry and that was not the first one to get to I was not going was it I would like it to be that I would like you guys to do the thing and then I go to sloths night and then go home and get a little done. That was lots of words that meme no sense or maybe a little. I really hope this works because this took me like ten minutes. This better be 100 words because I really really don’t want to count out how many words this is. So good bye and if you have stayed to read this whole thing so thank you very much. You should get this app. Thank your review! Sadly we don’t offer any free fonts for a 100 word review. I am not sure where you got this information from but all of the fonts are free without any unlocks. 100 words does 🅝🅞🅣 unlock anything.